Make no mistake: the established elite and its corrupt universities hate the full, deepest, correct history of Europe, because they hate reason.The only reasonable wise policy is to hate them in turn, just as president Franklin Roosevelt hated bankers (FDR said, adding that he “welcomed their hatred”). For 8,000 years, civilization has been propelled by ever better metallurgy. When the Conquistadors invaded Mesoamerica, they discovered that some of the nations had copper technology. Cortez’s crafty capitans taught the Natives to mass produce dozens of thousands of copper tipped bolts to use in Spanish crossbows against the Aztecs. Metallurgy enables superior war, but also superior agriculture: when their heavy iron plows were able to turn around the fat fields of Northern Europe, the well fed Franks grew and multiplied, and the center of civilization went north, where the water was..
Superior? How superior were the Greco-Romans? How superior were the Franks? A graph says it well. Ancient layers of ice in Greenland hold lead that originated at mines and foundries in ancient Greco-Roman and Frankish Europe. Fluctuations in the amount of ancient lead pollution that reached Greenland trace the economic impact of wars, plagues, and imperial expansion in Europe. The legend below the graph is an interesting example of the INSANE ANTI-FRENCH BIAS found in Anglo-Saxon literature, and thinking, in all domains (even physics, see note). Indeed look at the stupid timeline below: instead of mentioning the Franks (who had an enormous empire), “Visigoths” and “Moors” are mentioned. 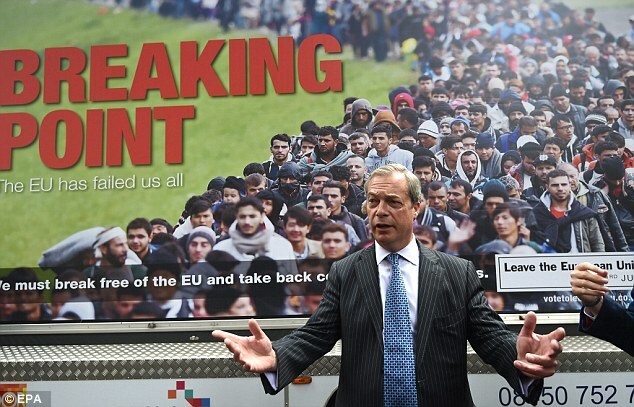 The Visigoths had been confined to Spain by the Franks. The Franks had sprawled over most of the rest of Europe: MASSIVE FRANKISH SILVER PRODUCTION CAME FROM EASTERN EUROPEAN MINES, CONQUERED BY THE FRANKS! That’s what the graph should be all about, instead it focuses on Muslim raiders, the ISLAMIST STATE (“Moors”) and Visigoths (who controlled Spain very superficially as their prompt collapse when the “Moors” invaded, showed. Details of the graph are analyzed in detail below. What about China not showing up in Greenland lead? Well China had a dearth of metals problem. All this wood construction in the East happened for some reason. The massive Greco-Roman and Frankish architecture was in stone, but it often was anchored by metals. When the Amiens cathedral threatened to collapse like a rotting pumpkin, the Franks aka French, surrounded it by a giganormous iron belt: hydraulic hammers helped (many other cathedrals got the same treatment). Civilization has been much about metal in the last 8,000 years. Earliest work on lead and copper has been found in Mesopotamia and the Balkans. By 3,500 BCE bronze (a harder alloy of copper with 11% tin) had been discovered in the same area, and metals had spread to Portugal and Britain. Metals were also introduced into China by Europoid people. Metals provided with the most important superiority of all: military. 5,000 years ago, Egyptians gave the highest worth to “daggers from heavens” made of meteoric iron. In the last three millennia, it’s pretty much those with the best metals who won wars, and metals drove history (the Etruscans invaded Italy where they did to acquire control of iron mines; the Celts had the best steel metallurgy, and equipped the Roman army, from sword, the gladius hispaniensis, to “Gallic” helmets). The classical world economy ran on lead. The Romans made extensive use of lead for water pipes (limestone deposits inside the pipes would quickly isolate toxic lead from the water). Lead was used all over “plumbing” (which means “leading”), weights, soldering clamps between ashlar blocks or columns in architectural construction, sheathing and ballasting the hulls of some ships, etc. A problem China had was the dearth of precious metals. Not so in Europe. The Greco-Roman economy ran on silver: Roman currency was minted in silver coins, the denarii. When smelting silver, adding lead to the crushed ore helps concentrate the silver. High-temperature smelting at around 1,200 degrees Centigrades, along with the process of separating lead from silver after the fact, released a lot of lead into the air over Southern Europe during Roman times. 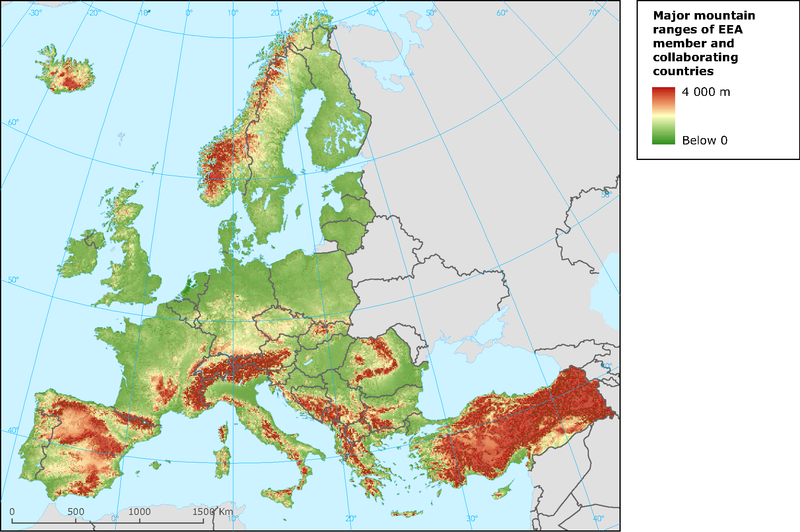 Thus lead pollution provides a proxy for the GDP of the Roman economy. Now historians have an increasingly detailed record of changes in lead pollution levels from year to year, in the ice sheets of Northern Greenland. (The Northern Greenland Ice Core Project produced a 423-meter-long ice core.). The core records nearly 2,000 years of annual ice buildup, from 1100 BCE to 800 CE. Each layer records slightly less than a year’s worth of accumulated ice, which traps other material, like lead from mines and foundries in Europe. Joseph McConnell of the publicly supported Desert Institute of Nevada and his colleagues have dated the layers with an uncertainty of just one or two years, enabling to see how historical events impacted lead pollution. Before I get to the Frankish superiority graph, let me relate a recent observation: I was in the Computer Science Museum in Mountain View, California, with the Google campus and headquarters all around. A group of Chinese scholars was there, with a particularly senior professor, with a cortege of full professor and student. The Chinese crowd stopped in front of the Antikythera mechanism, a Greek computer, 23 centuries old (mechanical computers reappeared with Blaise Pascal in 1642, then Leibniz 1673, and Bouchon (1725), Falçon (1728), Jacquard (1745). The senior professor turned towards all his entourage, and gave it a stern lecture on how much more the Greeks were than anybody else (including the Chinese). His audience, professors and students, listened religiously in rapt silence. That’s the right attitude to improve civilization, now firmly embraced by China (and, hopefully, life-president Xi will concentrate on that, and let the West handle the rest…). Why Greece collapsed next is a philosophical problem: Aristotle (and Socrates, and Plato, and Isocrates, and especially a gigantic war Athens lost, etc.) destroyed democracy. 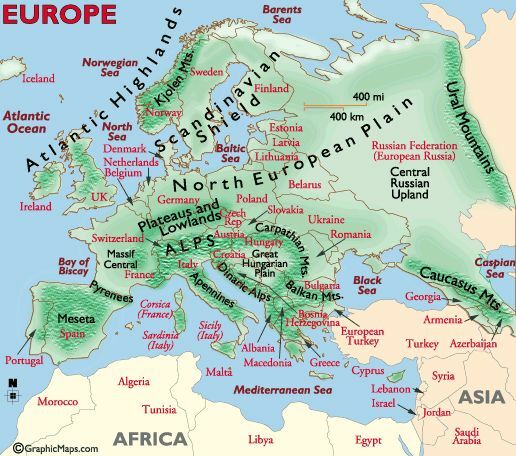 Yes, Europe was more advanced, at least in metal production, around 750 CE, just after breaking the back of the Islamist empire of the Umayyads (the “Moors”! ), is rich in important lessons. The traces of lead in ancient layers of Arctic ice got there because, somewhere in Greater Europe, foundry were busy smelting ore. When other layers got free of metal pollution it was because those miners and foundry workers were suddenly dismissed, fleeing, fighting… or dead. 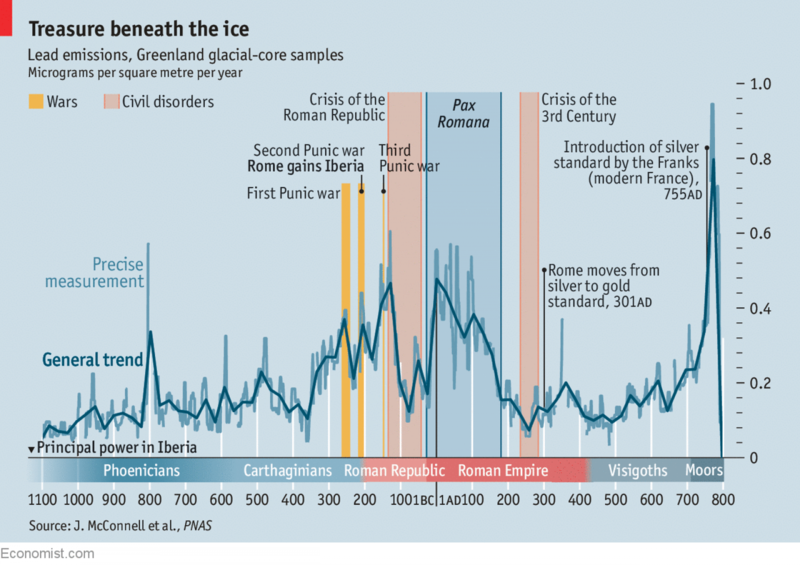 The ice cores correlate with wars throughout Greco-Roman and Frankish history. When conflict came to a mining region, as it did during the three Punic Wars between Rome and Carthage, it disrupted life and work in the region. It shows up as a year or two of cleaner ice in Greenland, since the Mediterranean was producing less lead pollution. At the outbreak of the first Punic War in 264 BCE, for instance, the amount of lead in the Greenland ice layers dropped abruptly: mining and smelting became secondary, war primary. But production ramped up again closer to the final years of the war: Carthage minted more silver coins to pay its huge mercenary forces (Roman forces didn’t need to be paid that much: they were drafted farmer-citizens). Wartime drops in production were followed by a recovery at the end of the conflict, as people returned to work and started pumping lead into the atmosphere again. After the end of the Second Punic War in 206 BCE, Rome got control of Carthage’s mines in Spain: thus a sharp increase in the amount of lead pollution in the ice core from Greenland. During the Crisis of the Roman Republic, a period of wars and threats thereof, from the late second to mid first century BCE, lead emissions from Europe stayed relatively low, while the economy was seriously disrupted. But as things stabilized, especially as Rome, led by “Augustus” conquered key mining areas in Northern Spain around 16 BCE, Europe began emitting steadily high amounts of lead that stained the distant ice. Under Augustus and the early Julio-Claudian emperors, until 64 CE, silver denarii were made from effectively 100-percent silver bullion; and were made of new metal (not recycled). In 64 CE, Nero cut silver to 80 percent in the denarii. Moreover, Roman mints started recycling old coins to make new ones. We now know that technology was floundering, and the mines were decreasing output(“world is getting old”, the Romans would soon observe). In 103-107 CE, under the enterprising Spanish general, now emperor, Trajan, the empire conquered Dacia, a vast territory in Eastern Europe, where silver mines were located. Trajan, as Julius Caesar before him, fully understood that the empire had to expand, or die. The empire briefly returned to producing coins from new metal again, and that coincides with a spike in lead pollution in Greenland’s ice. In 165 CE a devastating pandemic struck the Empire (Marcus Aurelius would die from it 15 years later). We don’t know if it was smallpox or measles. The Romans called it the Antonine Plague. Several waves of outbreaks killed as many as five million people, before it finally burned itself out in 193 CE. The general anti-reason, anti-technological drift of the empire finally opened, under Marcus Aurelius, the door wide to multiple invasions by Germans and Sassanids. Disastrous policies by Commodus furthered the problem (he abandoned lands conquered by his father). A Roman emperor and his son were actually killed in combat shortly thereafter, in 236 CE… a situation which had not happened for 350 years, since the Cimbrian-Teutones war (when Consuls were killed in combat, and, or their armies annihilated). However this time there was no further conquest (although there were reconquests under Constantine). Metal production entered an irreversible decline. When the war against the Islamist State became total in 663 CE, Roman emperor Constans II visited the city of Rome for 12 days. Constans infuriated the entire population by stripping everything of value to fund war against the Muslims. The roofs of Rome were covered in extremely valuable metal, which could be sold, or used to make weapons with (even the bronze roof of the Pantheon was stripped). All in vain: a jealous God, Allahu Akbar! Struck and the fleet carrying most of the metal sank on its way back to Constantinople). Why Did The Lead Production Collapse Again After 800 CE? Total War! Vikings! Avars! Muslims! In 800 CE, the Pope surprised Charlemagne by proclaiming him THE ROMAN emperor (a sacrosanct notion inherited from Roman Tribunes of the People), one and only. Constantinople, then under a regency, reluctantly agreed. Charlemagne reacted as if all this was an unwelcome distraction. There was a good reason for this, after 30 years of continual, total war against the Saxons, trying to finish what emperor Augustus had advised his successors not to finish. The Franks, correctly esteemed that ALL of Germany had to be conquered, anything else was not military viable. However, to their dismay, the Franks were finding out that there was a “Danish” problem. The Ninth Century became a century of total war, throughout the “RENOVATED ROMAN EMPIRE” (Renovation Imperium Romanorum) a combination of internal civil war between Franks, and invasions of the barbarians attracted by the riches of the empire. In 846 CE, the Muslims sieged Rome, burned the Vatican, before being thrown out by a Frankish rescue army. There is such a thing as a war economy, it doesn’t need money, when sufficiently violent. 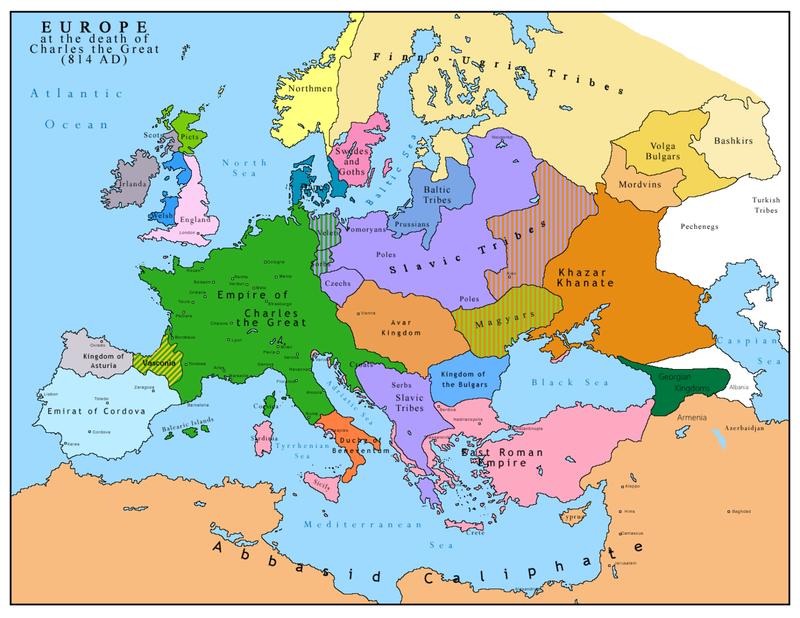 The war within the Roman/Carolingian empire, in the 9th and 10th century were terrible. The devastation, immense. In some battles (Fontenoy) up to 50,000 were killed in a few hours, a carnage not even viewed in modern times. Chronic Muslim raids haunted, all the way to Switzerland! Throwing the Muslims out of Provence required a combined operation of the Frankish army and the fire spitting Roman Navy from Constantinople. The dust would settle in the Tenth Century: Francia subjugated the Northmen, Scandinavia embraced “Christianism”. 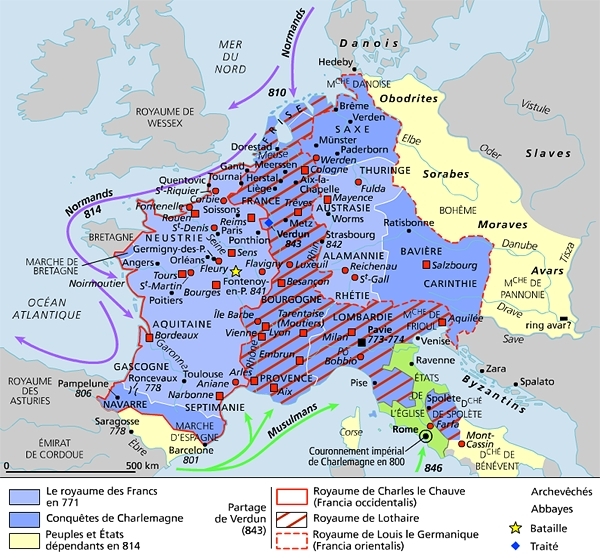 However, infuriated by the incompetence of the “Roman” empire, which had failed, for decades to subjugate the Northmen, although Frankish military power was great enough to do so, Francia elected her own king/emperor, and refused to participate in the election of the “Roman” emperor (that had also to do with the rise of the francized Saxons). Now equipped with her own king/emperor, West Francia exploded in 60 states (just as many as Caesar had found, a millennium earlier). By 950 CE, the Saxons had turned into perfect Franks and their “Roman” emperor Otto I, finally destroyed the Steppe men, the Avars. 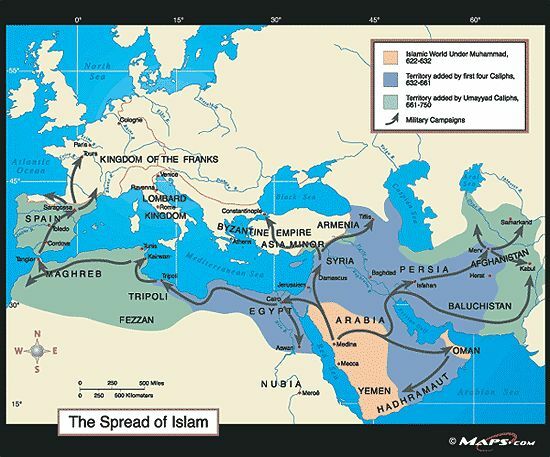 Soon the Normans and the Angevins would reconquer the Mediterranean islands from the Muslims, and Southern Italy. Not All Pollution Is Unsustainably Bad, Civilization Itself Is A Pollution! And it was all blown away by war. At least, for two centuries. The ice cores show that the Franks were much smarter than the Romans: when a worse ecological crisis started in the late Twelfth Century (from an overly large population, and the first cooling of the Little Ice Age), political leaders took the right decisions. One reason why history doesn’t always repeat itself is that sometimes, one has learned from it. 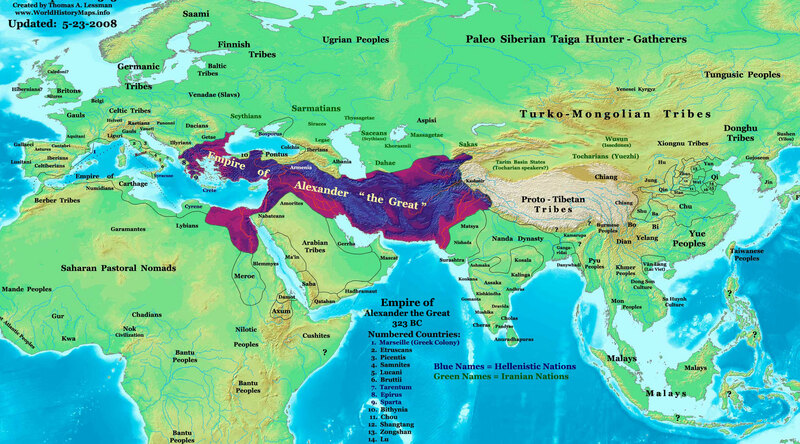 The Goths, refugees from the Huns, were attacked once on a sweltering 9 August 378 CE by decision of Roman emperor Valens. The Oriental Roman field army was hot, tired, thirsty, after a forced march in the morning. Some of the Roman commanders were arrogant. Rested, the Roman field army would have been invincible. Moreover, the Occidental Roman field army, itself also invincible, if rested, was marching in. But senior emperor Valens was in charge of the Oriental army and his nephew Gratian in charge of the Occidental army, full of Franks. The Frank Richomeres, head of Gratian imperial guard, sent ahead, told Valens to wait for the second field army (Richomeres would later become Consul, and head of all the Oriental Part of the empire, militarily; as a Frank, and non-Christian, he was refused the purple of an Augustus, yet he had imperium). But Valens wanted a victory of his own (Gratian and other commanders had theirs in preceding months). Valens decided to attack (his mind perhaps afflicted not just by the heat, but also the desire to self-annihilation of old fashion Christianism). His decision was all about hubris. A few hours later, the Oriental Roman field army was mostly annihilated, and Valens was dead. The Roman state would never recover from this disaster. Twenty-two (22) years later, the Franks were put in charge of the Roman defense of Gallia and Germania (400 CE). Twenty-eight (28) years later, the legions would be withdrawn from Britain, to save money, and hordes of savage Germans would break through the Roman empire, all the way to Africa. The Goths would take Rome, 32 years after the defeat of Hadrianopolis (410 CE). Now Hadrianopolis is a city in Turkey. And Turkey is full of exploding Muslims (mass attack of ISIL/Daesh on Constantinople’s airport, today). I was talking Brexit with an American friend with very long blond hair. I told her that, initially the language of the European Community was French rather than English, and that now things would change a bit. 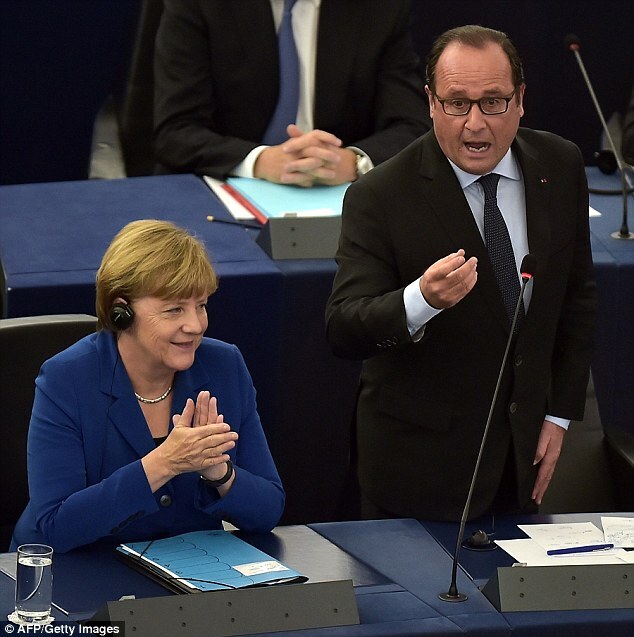 She was amused to no end: don’t worry, French is never coming back. Ever. Again. Never. Her arrogance made me think. Was it Hadrianopolis all over again? I mean, really, why would “Anglo-Saxons” and what I call the “West Country Men” mentality, be in natural control of the world? Because they are naturally born killers? West Country Men mentality, essence of lurid Anglo-Saxonia: Greed is the thinking reed which makes humanity wisely bend, as required by reality. Voltaire thought it was very philosophical to let such a mentality in charge of the World. Well, I don’t. It’s true, in part, but just in part, that greed as the reed can be useful. Yet, there are many other, even more crucial, dimensions to the human existence. In the US, and much English imagination, the “Latins” are viewed as bit players. At most good lovers. Yet, in Europe, Spain, Italy, France and their satellites have 200 million people. The English love to talk about the Magna Carta, forgetting that the rebellious barons were French. And when the French Revolution started, the “National Assembly” decided it was a “Constituent Assembly”. Where did that come from? Well what became known as the “National Assembly”, with 578 representatives, had been elected in 1788 CE (a year before the official start of the French Revolution). The English say: ‘we have this, too, Parliament…” Actually the powers of Parliament were set-up by a Frenchman who wanted to be elected king, way back. The English have Parliament, but it’s not really a National Assembly, as it is entangled with the non-elected “Chamber of Lords”. In 1789 France, the “National Assembly” made a coalition with (most of the) the Catholic church, and ejected the “Chamber of Lords”, never to be seen again. Who were the Franks? The European Union! Indeed, the Franks were NOT a tribe. They were a “federation”. A number of people who had taken an oath. From foederare (league together) and foedus (covenant, league). The Salic Law of the Franks was initially written in Latin by Roman lawyers. So not only the Franks were not a tribe, or nation, but they embraced the notion of being endowed by superior ideas, even if they came from others. The French agreed to Great Britain entry in the European Community, 45 years ago. In retrospect, it may have been a mistake. But who could guess that Britain would be such a bad player? Refusing the free circulation of citizens of the Schengen Treaty, blackmailing for a rebate, organizing tax havens, grabbing most Euro trading, refusing the Euro, while staying inside the European Monetary System to sabotage it, fostering global plutocracy while spreading outrageous lies about the European Union’s alleged lack of democracy? Britain was needed, because of its heft, and its military power. But the latter, and its connection with morality, has faded in recent years, witness the Assad debacle: the UK Parliament refused to attack plutocrat Assad, because the UK does not attack plutocrats. Great Britain loves plutocrats and especially their money, no questions asked. Due to budget cuts, and ethical cuts, Britain is much less than what it used to be militarily. The French Republic then is the only significant military power in Europe, and can make Germany pay for it, by running deficits (that’s the implicit accord, obviously). Europe is just a trading place, say Europhobes. However, it is more. It is a place of solidarity. Solidarity is a better way for interacting harmoniously than hatred and alienation. So, in a spirit of solidarity, and to bring up its abysmal economy, London was enabled to get away with much, enriching itself, impoverishing the others. the City of London should no longer be able to clear euro-denominated trades, the French president said on Tuesday, June 29. François Hollande said at the end of a summit in Brussels where EU elected leaders started trying to consider the wreckage of David Cameron’s referendum catastrophe, that it would be unacceptable for the trading of Euro derivatives and Euro equities to take place in the UK. High time. Amen. Let’s do it. Move London over to Paris and Frankfurt.